The French Brioche is a very elegant bread - in a class all on its own. Brioche is not quite a bread, not quite a cake - but somewhere in between. It should always be eaten fresh - and certainly never rushed. Blend the yeast with the lukewarm milk. Stir in the 1/4 teaspoon of sugar and 1 1/2 oz flour. Mix well, cover the bowl with a piece of oiled plastic cover, and place aside in a warm place until frothy. Sift the remaining flour with the salt into a bowl, rub in the butter or margarine until the mixture resembles breadcrumbs and then add the castor sugar and beaten eggs. Stir in the yeast liquid and mix together to give a fairly stiff dough. Turn out onto a lightly floured surface and kenad well. Place the dough in an oiled plastic bag and set aside in a warm place to prove. When the dough has risen, turn it out onto a lightly floured surface, punch down the dough and knead lightly. Take three-waurters of the dough and roll itinto 8 - 10 balls. Place each ball in a buttered fluted brioche tin or deep patty tin. Roll the remaining dough into 8 - 10 small balls, elongating them slightly to make them pear-shaped. Press a finger into eachof the larger balls in the brioche tins to make a well, then fit the stalks of the samller balls into each one. Place the brioche tins on a baking tray and cover with oiled plastic wrap. 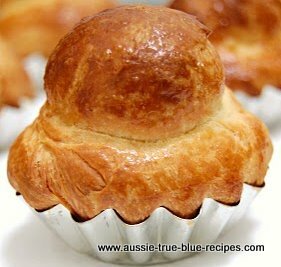 Set aside in a warm place until the brioches rise out of the tins, then if desired, brush them with a littel beaten egg. Bake in the centre of a hot oven (220°C) for about 15 minutes until well risen and well browned.